Apo Island will always be a prime destination for diving! After a wonderful hop to Siquijor, we cruised back to Dumaguete for retracing back what I have left behind five years ago. You know, there are few things you wanted to savor again after some time, those moments that kept lingering in your mind. The wait was over, smiling as I watch from afar the night lights at the city’s pier. The Saturday night festive mode gave us a warm welcome in the city. If you are a diver and you travel to Dumageute City, chances are you are aiming for Apo Island in Dauin, one of the world’s best known community-organized marine sanctuaries. We started early next morning for a mass, fitting to start our Sunday events – a thanksgiving and worship for the gift of nature from one island to another. How I waited for this home coming at Apo Island, the underwater scenery kept playing in my mind. Unlike in our travels in the past, it was our first time to have back-to back dives in two different locations in succession rolled in one trip! If there’s one individual to be grateful what Apo Island is now, it is Dr. Angel Alcala (of SU Marine Laboratory), his efforts paid off and the community’s participation is one great aspect that help greatly in the preservation and protection of its marine resources, emulated by other coastal communities in the country. 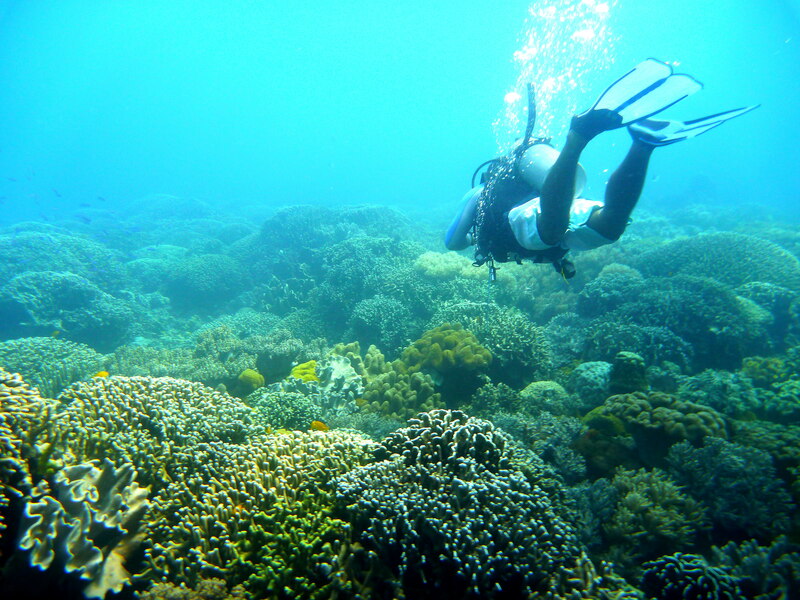 Apo Island has been a renowned model in coastal resource management. Our DMs picked us up promptly and we drove for about 45 minutes to Dauin, the short drive was a venue for “getting to know”. As usual, apart from names and addresses, the most common discussion is about dive sites explored. The Chinese couple was glad hearing about diving Siquijor, their next destination. 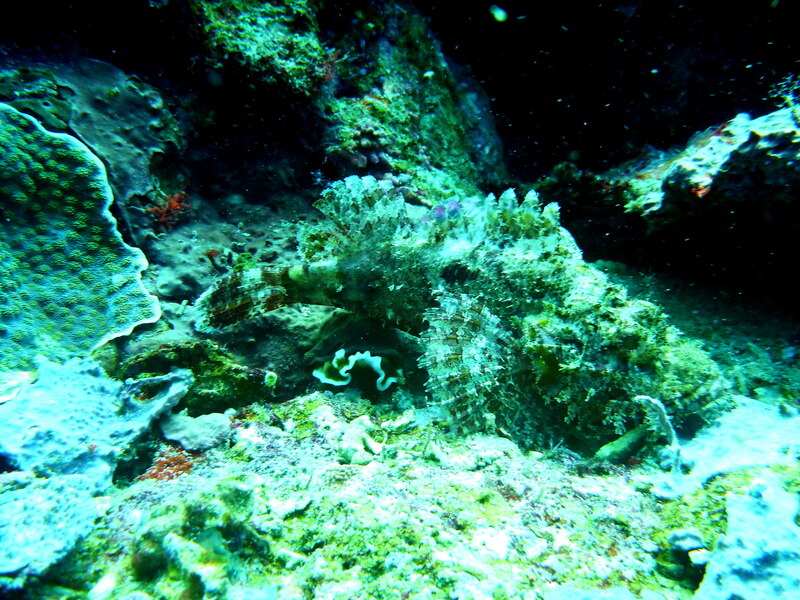 They were just recently certified divers and were just ecstatic exploring new sites. Have you encountered garden eels? Our first descent was in Chapel (because according to DM Richie, it’s near the chapel of the island), and as I expected, the rich diversity is imminent – field of healthy corals teeming with fish life. My favorite moray eel was peeking from her hole, perhaps unmindful as we passed by. 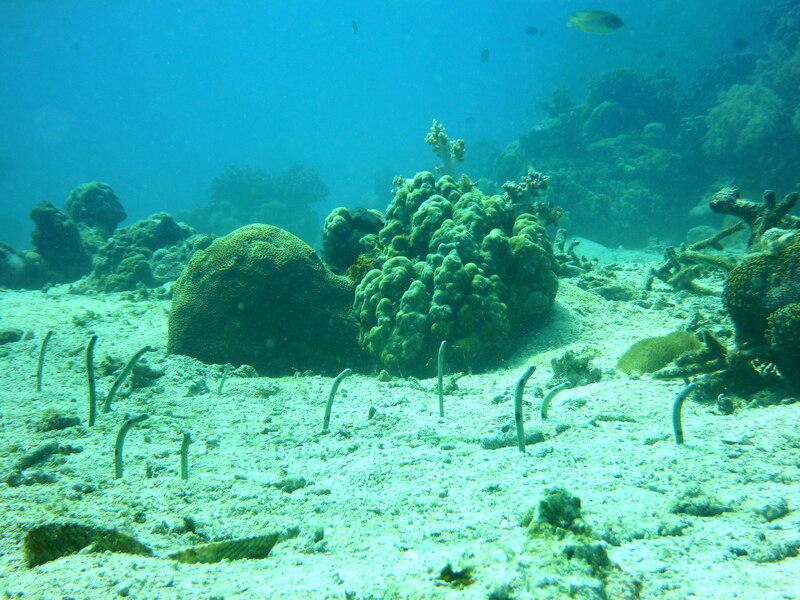 We sighted variety of nudis, stonefish and when we got over a white sandy area, the garden eels at least ten of them, poking from their holes. I tugged Angel to get his attention but as we get closer, they all disappear! 🙂 So playful. The juveniles contently hovering the coral field, just like what we did. We lingered over the wide coral area – hopping, swimming, floating – feeling its vastness. The visibility was perfectly clear! We ascend after 44 minutes with my air still at 100 bars. Our desire to step once more on the island’s shores was granted, the DMs announced that our boat shall docked near the sanctuary for lunch and the necessary surface interval! I was thinking of watching up close the granite rocks again near that small patch of white sands. But snorkeling in the shallow waters took my time away, it was a show while floating and watching in silence the rich marine life. 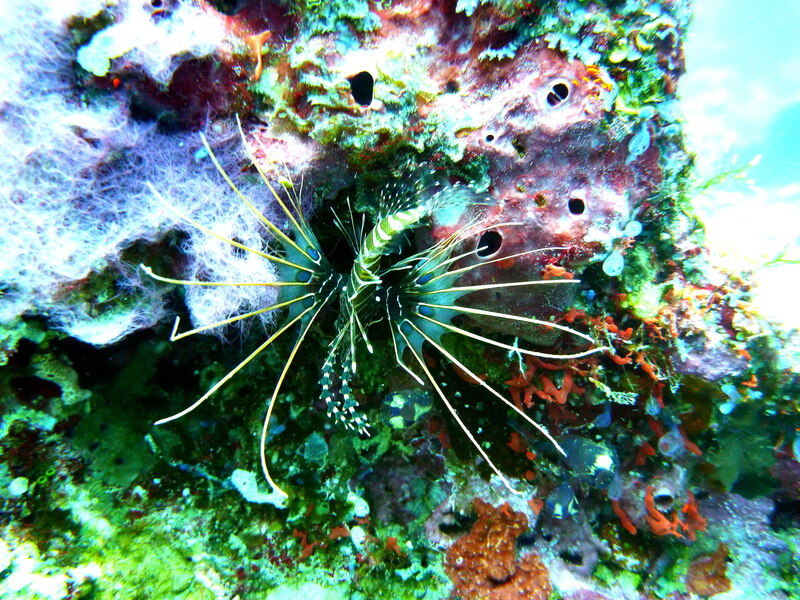 A juvenile peacock lionfish decorated the reef! Our last descent was just nearby at Katipanan towards south of the island, another richly decorated with diverse marine life. It is a steep slope but definitely with no currents during our dive, we hovered at first on a coral garden until we go deeper from the brink, our deepest was 21.5 meters. Apart from the tropical fish, we feasted with nudibranches and turtles! Again we lingered over a wide coral area obviously in perfect condition and corals just outdo each other in color and shape. We slowly ascend back to the flat sandy slope, still in oblivion I wanted to linger having more than enough air but our DM signaled for ascend. My bottom time was at 44 minutes with 110 bars of air. So far, I explored only five sites in the island out of twelve, obviously the remaining seven are equally rich and diverse in marine life, a perfect reason to be back. 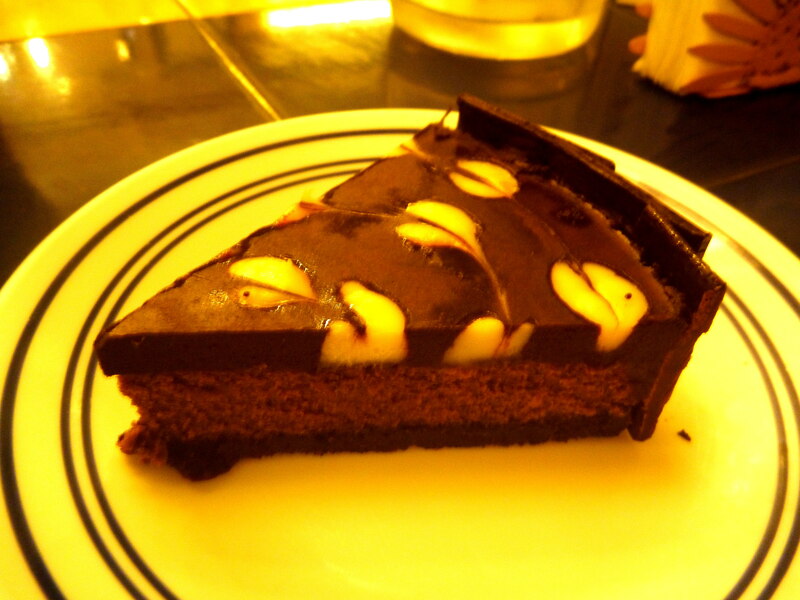 Sweet dacquoise of walnut & dates! Casablanca salad, freshly baked baguette and potato salad is more than perfect for our taste! Capping our wonderful dives from Siquijor to Apo Island was just proper, a kind of celebration for such gratifying moments in the depths. So, we had a lovely dinner in Casablanca (our favorite!) and later hop to next corner for coffee and pastries at Sans Rival. And we got home on foot exploring the calles despite the drizzle, perhaps to shed off our fullness and to catch the city by night mode in the streets. How about that? 🙂 It was all glorious! 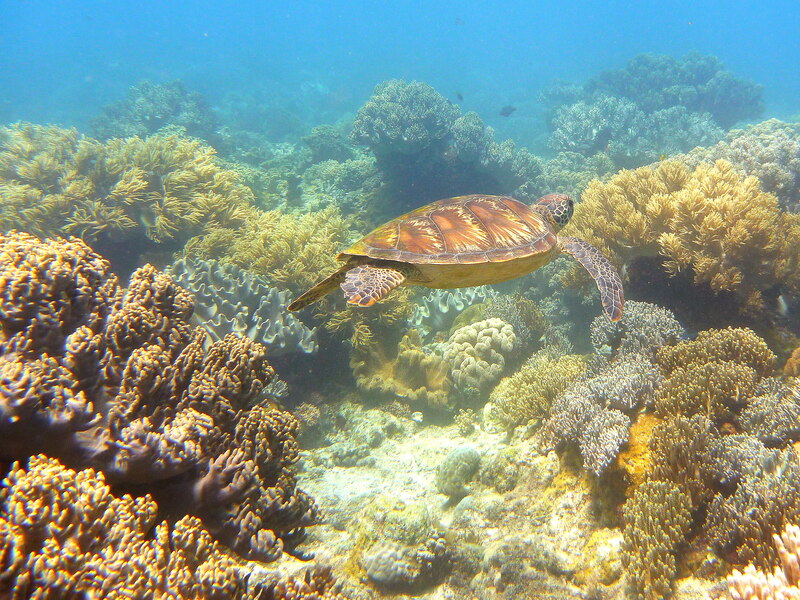 Apo Island – its enticement will make one promise for a return! NB. At present, the island is home to over 650 documented species of fish and estimated to have over 400 species of corals. Most of the Philippines’ 450 species of coral can be found here, from tiny bubble corals to huge gorgonian sea fans and brain corals. Visitors and tourists pay a fee to enter Apo Island and to snorkel or dive in the marine sanctuary there. These fees are used to keep the sanctuary clean and in good condition.